Smutty likes a good zombie movie as well as the next feline, but lately the whole zombie thing has been a little flat. Too much sameness, not enough surprises. But now, Brad Pitt of all humans, has saved us from the dreariness of repetition. World War Z, the zombie movie you have been waiting for. Again, the zombies come to us in the form of a virus (what’s up with that, are they cooking some virus that might create zombies), it tracks Gerry Lane (Pitt) as he tries to find the start of the epidemic and end it. Hey, isn’t this usually Bruce Willis’ job? 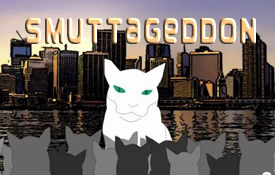 If the entire movie lives up to the trailer, Smutty will be a happy feline. The trailer enlists viewer interest in what happens to the central character and has you rooting for him to win. This is a critical plot point many action movies ignore. Smutty actually wants Lane to win. Some zombie movies are so poorly done Smutty roots for the zombies. Smutty will bank up some naps so he can catch the scheduled release date in June, 2013.